Man made artificial reefs are not a new thing by any means. The Japanese have been building them for over four hundred years to improve their fish stocks; they’ve been determined they won’t run out of sushi. Canada, America and Australia, have been sinking ships as diver and angling attractions for up to thirty years or more. Brazil is currently manufacturing concrete reef balls which have pioneered reef restoration throughout the world. In India villagers make triangular concrete structures utilising the very sand from their beaches, then they sink them to redress the damage done by commercial trawling. The list goes on. In fact, only a few miles away, a reef is being constructed by a New Zealand company to facilitate wave formation for surfers. This is happening now, off Bournemouth Beach. Even closer to us in Poole Bay, Dr Ken Collins of Southampton University has been monitoring an artificial reef that he had constructed back in the eighties, and if any of you had been to one of his fascinating lectures on this subject you would have seen the resounding success of the increase in marine life in what was previously a relatively barren area. The upshot is that artificial reefs work for whatever is asked of them. There has been much academic research done on this subject worldwide, including Southampton Universities’ and all this is well documented. By and large, this research shows that provided the obstacles used for artificial reefs are environmentally clean, and are heavy enough not to migrate from where they are placed, then the biodiversity of that area will increase dramatically. Worldwide, artificial reefs pay for themselves through an increase within the local economy within two to five years. The Scylla that was sunk in Whitsand Bay, Plymouth was ahead of the game and recouped the South West Regional Development Agency’s investment of £1.38 million within fourteen months. It continues to generate over £1m annually. Weymouth and Portland Wreck to Reef Ltd is the non-profit community group behind the push to obtain permissions to source and to sink a ship as an artificial reef at a location to the east of Weymouth and Portland. The general national decline within the diving industry has been exacerbated in Weymouth and Portland by three things, the sinking of HMS Scylla in Plymouth, the building of an accessible launching facility in West-Bay at Bridport, and a ban on diving the HMS Hood in Portland Harbour, this for safety reasons. Drawing on the experiences and the resulting benefits of previous man made artificial reefs, notably in Plymouth but also around the world, it is believed that this project will help redress the economic down-turn within our diving industry. However, since the inception of this Idea late in 2008 it has become apparent to all involved, that the complexity of a project of this nature needs the involvement and support of all the statutory authorities who would have an interest in this. This in turn has led to the Idea that rather than go to all this effort in order to sink a single ship, for a single section of the marine industry, it would make more sense to broaden the thing out and aim to secure an area of seabed that could be set-aside for numerous artificial reefs; a sanctuary of artificial reefs. It is proposed that this seabed area be ‘Adopted’ by either the Local Authority or the County Council after all permissions are obtained by Weymouth and Portland Wreck to Reef Ltd. Thereafter the area would be managed by a Working Group combining all interested parties, e.g. Weymouth and Portland Borough Council, Portland Port Authority, Dorset County Council, Marine Fisheries Agency, Representatives of the local fishing industry, Representatives of both the Local Angling Charter boats and the Dive charter boats and Weymouth and Portland Wreck to Reef Ltd. It is envisaged that the Artificial Reef Sanctuary would reflect real everyday local life. What is meant by this is that Weymouth and Portland has a working marine tourism industry and a fishing industry and the two are inextricably linked and overlap; the Sanctuary would be an extension to these things. Because of the serious decline within the diving industry locally, the first ship to be sunk would be prepared with the Diving Industry in mind. It is suggested that after the initial ship is sunk, subsequent Artificial Reefs within the sanctuary be variously assigned to Angling, to Fishing, to Nature and Education. It is not proposed to seek any restrictions within the sanctuary area that would alter the status quo with regards to existing commercial fishing practices. On the contrary it is expected that the fishing industry, through involvement within the management of the sanctuary would decide for their selves on best practice. As things stand there is no substantial wreck to the east of Portland sheltered from the prevailing westerly winds. This is an obstacle to dive planning and operations. Divers who book weekend accommodation and charter boats simply do not come back if their weekend or indeed their holiday is blown out by a westerly. This has been the overriding criteria for the choice of site; shelter from westerly winds. The favoured site is a triangular area of 525,000m2 within Balaclava Bay. (See chart) Although the maximum depth of 18.2m is not ideal, it has relatively slow tidal streams, is very sheltered by all but winds from the easterly sector and is very accessible. Portland Gas Ltd will be laying two gas pipes through this area and there will necessarily be a 25m exclusion zone either side of the pipes. Portland Gas Ltd has indicated that provided we adhere to this restriction they will have no objection to the project. 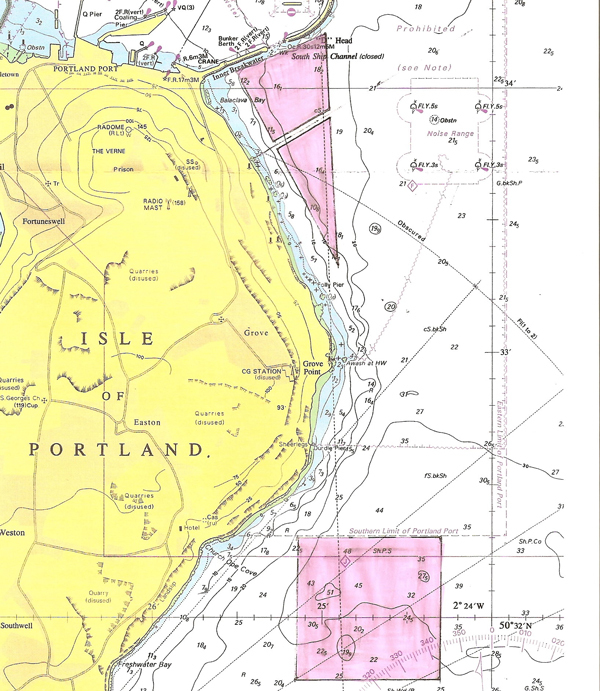 Balaclava Bay is within the outer harbour limits of the Portland Port Authority and as such will fall within the ports jurisdiction and will require permission from the Port Authority. This is a double edged sword of course. On the one hand it is yet another permission to obtain but on the other it is an added level of control. The Northern boundary of this proposed site runs adjacent to the Southern or ‘Hood’ Portland Harbour Entrance. It is not inconceivable that the first proposed ship (see ship below) could be placed in a parallel position to The Hood to act as an additional baffle to the tidal flow through that entrance. The Crown Estate was presented with both location options and the pros and con’s explained to them. It was their view that the Balaclava Bay option was preferable. Their reasoning is that as the site falls within the jurisdiction of Portland Port Authority there is a measure of control already in place. In principle the Crown has agreed to a seabed lease with certain restrictions, covenants and conditions. The lease would most likely be a Regulated Lease with Extraction Provisions. A statutory body will need to be found to become a tenant of the Crown and take on the lease. This was discussed with the Crown Estate and it was suggested that either Weymouth and Portland borough Council, Dorset County Council or the Regional Development Agency could be candidates for this. At the time of writing we are in negotiations with Dorset County Council with regards to this. The Crown Estates did not charge for the lease for the sinking of the Scylla on the grounds that the project was for the public good. The Olympic Sailing site, Osprey Quay and its associated developments, although at present unfinished is without doubt a splendid achievement, and a credit to those involved. However you don’t have to walk very far from Osprey Quay, to Castletown in fact, to see a very different picture. In 2003 local business woman Liisa Wallace was the authoress of a diving survey in support of a previous attempt to sink a wreck as an artificial reef. In this report she wrote: ‘If diving were to cease in Castletown the community might well look forward to the boarding up of virtually every business from Cadet’s Corner to the dockyard gates’. Sadly Liisa’s prophetic warning has nearly run its course with two thirds of those businesses already boarded up. It is not only Castletown that is suffering the effects of the local diving industry decline. Of the eight dive shops that existed within Weymouth and Portland there are now only two left. Of the twenty four dive charter boats that were in operation there are only a third of them left. The others are either gone out of business or have diversified into angling. However there is only so much of the angling cake to share around. Weymouth and Portland Wreck to Reef Ltd is now included in the 2012 Olympic legacy. The experience of other artificial reef projects suggests that successful marketing is likely to be a key factor in determining the overall success of the project. In fact the Scylla Project in Plymouth paid for itself within fourteen months. (£1.38 m) This was ahead of the game, as normally on a world-wide basis, artificial reefs recoup the initial outlay between two and five years. It has been shown that the Scylla marketing campaign, backed by the resources of the National Marine Aquarium (NMA) in Plymouth was very comprehensive. The NMA mounted a publicity campaign in order to raise awareness amongst the public by participating in tourism events, activity and dive shows around the country, circulating leaflets and flyers, advertising in the diving press and through the development of a website. Learning from the Scylla Project, Weymouth and Portland Wreck to Reef intend to follow suit with a few innovative additions. A website is already in place and will continue to be developed. See www.wrecktoreef.co.uk . It is proposed that the ship be moored in Weymouth Harbour to be decommissioned and prepared between the months of May to October. This will benefit the local economy before the ship is sunk by inviting local marine engineering companies to tender for the decommissioning. This will also raise the profile of the project by having a war ship alongside during the summer months. Being able to view the ship first-hand as it is being prepared for scuttling will have a dramatic impact on the general public. Talks are underway with the Weymouth Harbourmaster to ascertain the feasibility of this idea and if all practicalities are satisfied the idea will be put to the Harbour Consultative Committee in January 2009. It is proposed that Weymouth and Portland Wreck to Reef work closely with schools and colleges to bring the benefits and opportunities of this project into the classroom. There is an opportune coincidence of Natural England rolling out a new and innovative campaign aimed at youngsters entitled ‘Undersea Landscapes of England’. This is designed to bring an awareness of the undersea world into the classroom. Karen Mitchell of Natural England has been contacted with a view to establishing a close liaison. We would like to combine this national campaign with our local project. To this end, both our Education officer and our Project Coordinator have met with Jane Fooks, Development Director for the Portland Academy, as a first step towards establishing interest in marine life within the school curriculum; for example, the evolution of a reef. We see this as a pilot project to be rolled out if successful. A live web-link to the artificial reef is proposed. We have taken advice on the practicalities of this from members of the Dorset Marine Network and conclude that this is feasible. The Old Engine Shed which is due to become an interpretation centre for Portland is within line of site of both of the proposed Wreck to Reef locations. This interpretation centre is being funded by Portland Gas Ltd. Their representative Rachel Barton has indicated that we may be granted permission to house a monitor in the Centre to receive the live web-link via a radio buoy attached to the wreck. From there it could be downloaded to schools and elsewhere. Andy Perry of the Marine Fisheries Agency (MFA) has been contacted and made aware of our project. We will need to obtain consent under section 34 of the Coastal Protection Act and also consents from DEFRA with regards to anything relevant under the Food and Environment Protection Act (FEPA). The case we intend to put to the MFA is twofold. Broadly speaking the first is that this project is economically beneficial to the local community which includes fishermen, both commercial and leisure. We will support this with our economic impact report. The second is both environmental and commercial at the same time. Our assertion is that an artificial reef sanctuary will inevitably lead to an increase in the biodiversity of that area. In turn this will lead to a seeding of the immediate and wider area. The level of commercial fishing within either of the proposed areas is such that it need not be curtailed in order to achieve this increase in biodiversity. No –take areas are very contentious issues within the fishing industry. As has been said previously it is not the intention to declare the location as a whole a no-take area. However it is reasonable to suggest that one or more of the individual artificial reefs be set aside as no-take areas with say a 25m boundary. This would obviously not apply to reefs dedicated to angling. In order for this concept to work, the cooperation of all would be needed. Further, as has been said earlier, it is hoped that commercial fishermen would become involved in the management of this project through the Working Group and have a say in its evolution. A ‘Baseline Field Survey and Environmental Impact Assessment’ was commissioned in 2006 for an area adjacent to the Proposed Sites. The Author was Dr B Baldock and the report was commissioned for a previous attempt to sink a wreck by Liisa Wallace who has kindly allowed us to make use of the report if we can. If this existing report proves to be unacceptable for any reason we will have to commission a new one. Fiona Wynne, Coastal Stewardship and Environment Manager, Crown Estates, has invited us to apply for a grant to facilitate a new Baseline Study should the need arise. The idea of placing artificial reefs within the same geographic area that have various ‘take’, or ‘no-take’ status is an interesting one. From a research point of view there is potential for comparison studies using a no-take artificial reef as a control. The local dive industry would be encouraged to become involved in data collection in an ongoing project that could be linked to tourist divers as an added incentive to come to the area. Southampton University are world leaders in artificial reef research and Dr Ken Collins of the university is being encouraged to become involved, and give us a lead in this. impact studies. The strategy employed to enable this project to reach a successful outcome is to initially find funds from within the marine industry, particularly dive related companies, to enable a paid Project Coordinator to secure all necessary permissions and to source and manage the sinking of a ship. At the time of writing this report, O’three Dry Suits and Fathom and Blues have financed the project to date. Others have given their time and expertise such as website development by Cocoa Media and voluntary time by C-Waves Diving. All supporters will be advertised on our website. Recruiting continues and more supporters are coming aboard as we progress. Grant providers such as Chalk and Cheese and the Weymouth Partnership are being approached, as well as Sport for All, in an attempt to achieve continuous funding of this stage of the project. The South West Regional Development Agency (SWRDA) is seen as the main financers of the Project with regards to the purchasing costs of a ship, the decommissioning costs, the towage and mooring costs and the scuttling costs. It may be that the underwriting costs are also born by SWRDA as was the case in the Scylla Project in Plymouth. The Crown Estates have indicated that they may fund a Baseline Study and also the costs of a Management Plan. Sean Webb, Marcus Darler, Ron Spree, Dale Spree. O’three Drysuits, Fathom and Blues, Scymiter Diving, C-Waves Diving, Quality Time Training, Cocoa Media, Resort Marketing.